PiPE DREAM theatre | Drama free for zero days. Yesterday we moved into Theatre Row! Over the next few days, we’ll be setting up lights, sound, loading in all the props and costumes, and acclimating our cast to the new location. In the meantime, let’s get to know a little bit more about the show. Columbia: the life and death of Rospo D. Oro is a heartwarming musical filled with whimsical, outrageous characters. Today, we’re going to take a peek at some of the characters you’ll meet along the way. And remember, Columbia is based on Kenneth Grahame’s The Wind in the Willows; many of the characters in the show are taken from the book (but hidden behind different names… well, except Ratty). When you come to the show, see who you can match up between the musical and the novel. And truthfully, you’ll probably want to come see it twice to do that (crafty, aren’t I). Grab your tickets HERE. For extra-extra credit, try to decode why they were given those particular names! 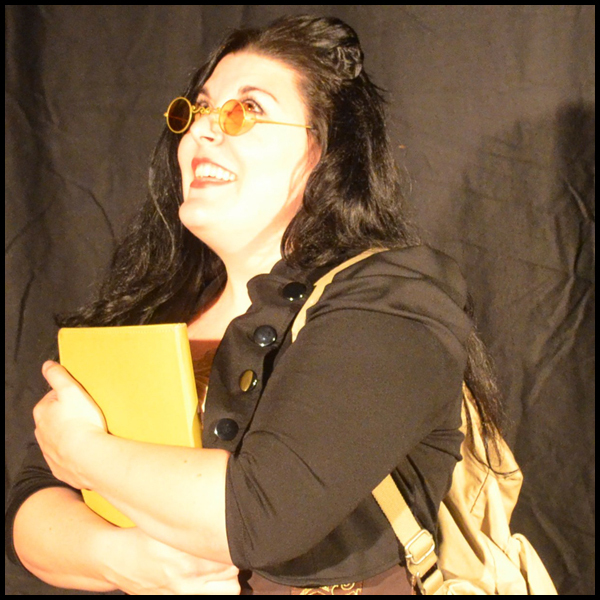 Rospo D. Oro (played by Alex Parrish) is an eccentric inventor and vehicle enthusiast. Although extremely lovable, Rospo has a dark past that tortures him. 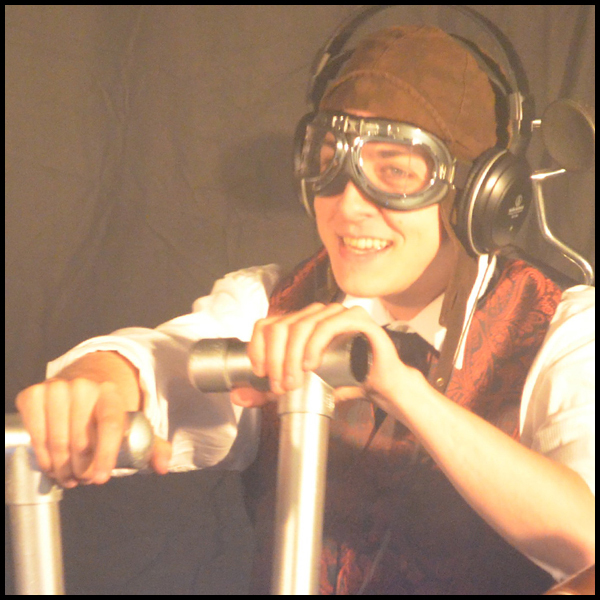 He sees things in his mind that may or may not be there, and these inner demons push him to go further and faster in his contraption he named “Columbia” – with little regard to anyone’s safety. It’s because of this, he is constantly at odds with the vocal inhabitants as well as some of his friends. 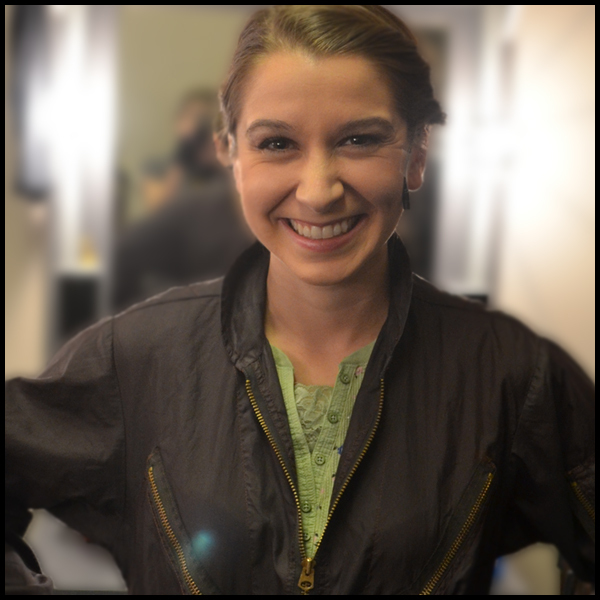 Netty (played by Liz Muller) is what’s referred to as a Caver; she has lived her whole life in her underground home in The Under Harbor. She’s never seen the sun, a tree, a river – and now she’s finally decided to come above ground and see what there is to see, and write a book about it in the process. She’s an innocent soul who is amazed by the new world around her. 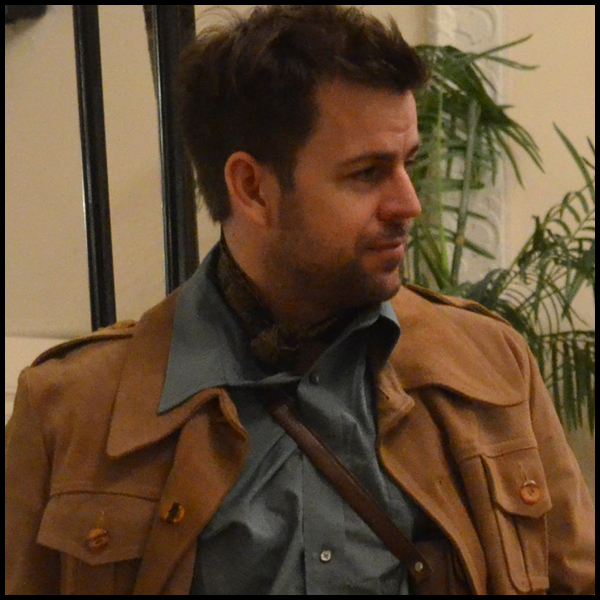 Ratty (played by Adam du Plessis) or, Radcliffe properly, is a Riverbanker who lives on his ship, Endeavour, along the Grand Culvert; the main river that splits The Wild Woods in two. Ratty is a simple, gentle man who loves his boat and his life, and though he does dream of sailing to The Great Deep, he has little time for dreams and fantasy. Jewels (played by Amanda Teneriello) is Rospo’s right hand gal. She is his mechanic and friend – and although he doesn’t seem to return her feelings, she is in love with him. Rospo found Jewels on the side of the river in a cradle, seemingly abandoned by a Seafarer. He has looked after her every since. 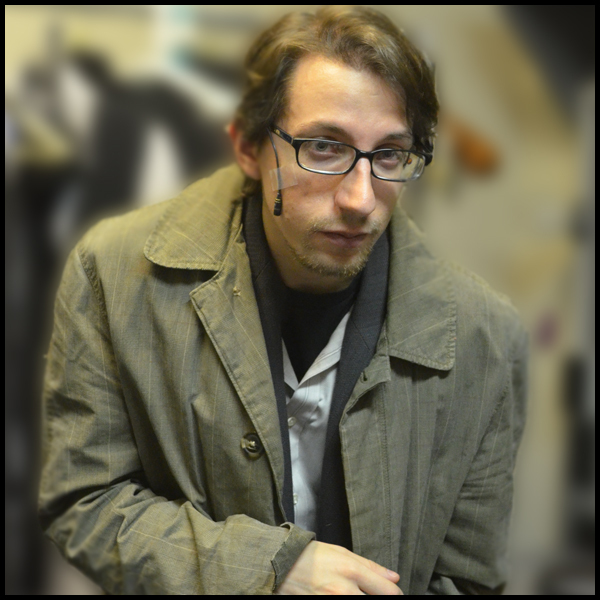 Aric (played by Anthony Malchar) is a mysterious character that lives underground in Raven’s Hollow. He isn’t a born Caver however – though little is known why he stopped and claimed stake to an abandoned, sunken building from a civilization long gone. Aric watches Rospo from a distance, but has such contempt for society, that he remains hidden as much as possible. Aric enjoys long walks on the beach and – …just wanted to see if you were still reading. The interesting thing is; these are the normal characters! You’ll have to come see the show if you want to learn about the child-like god; Pan, or the iron fist-ed Chairman, or the sadistic Doctor Fish, or any of the many others. For the past two weeks, PiPE DREAM theatre has been hard at work rehearsing their newest original musical; Columbia: the life and death of Rospo D. Oro. Don’t worry though, we’ve seen and read A Christmas Carol enough (we even wrote our own musical based on it: 3 Ghosts) to know we had to give our cast a break for Christmas. …and a fair amount of silliness. And remember, tickets to see this amazing new show are a great last minute Christmas gift. Just head over to Telecharge and instantly buy 1, 2, 20 tickets! They also make wonderful New Years gifts… or good Run it Up the Flagpole and See if Anyone Salutes Day, or Festival of Sleep Day, or Fruitcake Toss Day presents (yes those are all real – if you don’t believe me then be sure to celebrate International Skeptics Day on January 13th). 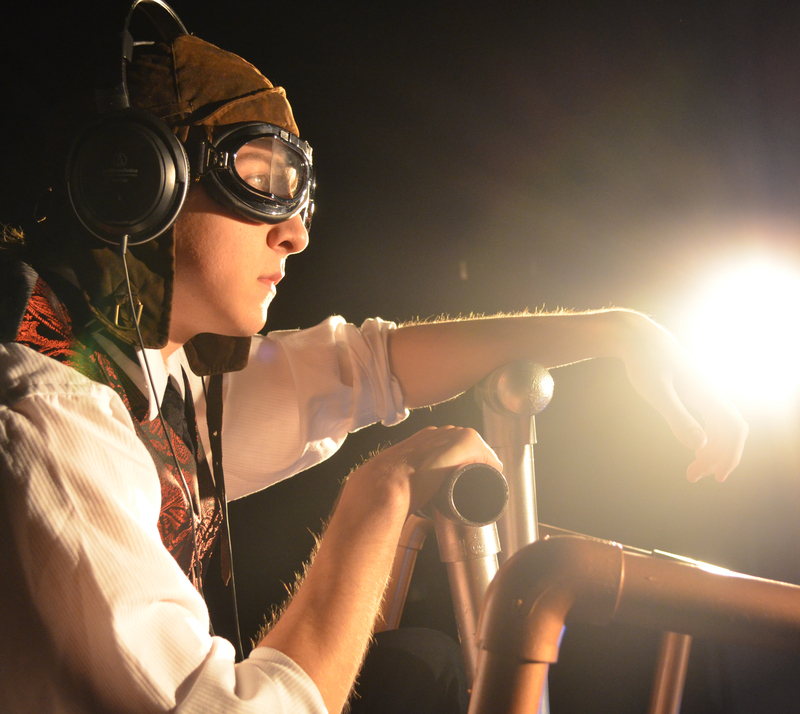 Shows run from January 9th – 25th, but get your tickets early so you can come see it twice. You’re gonna want to. What Is, Columbia: the life and death of Rospo D. Oro? There’s a simple answer: Columbia is a new musical directed by Liz Muller, with book and music by Collin Simon, and lyrics by Liz Muller. The more complex answer: Columbia is a romantic, comedy, drama, adventure, fantasy, musical based on Kenneth Grahame’s The Wind in the Willows. For the answer, turn your computer upside down. Actually, there aren’t any toads in this version – or rats, or badgers. In fact, the story is only loosely based on The Wind in the Willows. For those who haven’t read the story, don’t worry – you don’t need to! And for those that have read the story; there will be plenty of surprises for you – trust me. Even after you’ve seen the show once, you’ll want to come back again to get all the fun side stories, references, and symbolism – well, that, and you’ll want to hear the songs and see the wonderful performance again and again. Columbia is a story with something for everyone. You can watch it as just an exciting tale, or you can delve in deeper to the many different meanings and story lines. In fact, it’s hard for me to even write about it without giving things away! At it’s most literal, the story is of a man, Rospo D. Oro, with a mysterious past, obsessed with vehicles – always trying to go farther and faster. His flagship vehicle, Columbia, is his pride and joy. With the help of an orphan named Jewels, he continues to modify and improve it. Along the way, he meets many colorful characters that both help and hinder him in his quest. The help comes with the hunt for Rospo’s perpetual motion engine, the M.I.U. The hindering comes from the townsfolk and law that are none too happy with the accidental destruction Columbia causes when Rospo takes it rocketing through the streets of Cradle Island and the forest villages of The Wild Woods. Each of the other characters have their own hopes and dreams, and forces helping and hindering them as well. There’s Netty, Radcliffe, Jewels, Aric, Pan, Handsome John, Lady Atrous, Doctor Fish, The Chairman, and more. Don’t worry, we’ll get into all of them in the next few blogs – along with the mysterious creatures; The Obscure, the world of Columbia, and more. Can’t wait till then? Go over to the official site and watch the trailer HERE. Keep checking the blog and your email for more articles when they become available. And while you’re waiting, you might as well head over the the Telecharge site and buy your tickets HERE. If you buy the whole house you get to hang out with the cast and crew after the show for a Q&A and hugs… Okay, maybe no Q&A, but definitely hugs. Yeah. No. But the exciting information will be coming SOON! Meanwhile we’re gearing up to begin shooting another film (a la Masque of the Red Death), and rehearsals for The Mikado will be kicking in as well. And AND don’t forget we’re starting an easter-egg scavenger hunt/contest for our keen eyed fans. Missed that announcement? Go and signup for the newsletter and you’ll never miss it again. I’ll wait. And since it’s been a while since I’ve asked you to buy something, why not take yourself over to our Printfection Store and load up on merch? 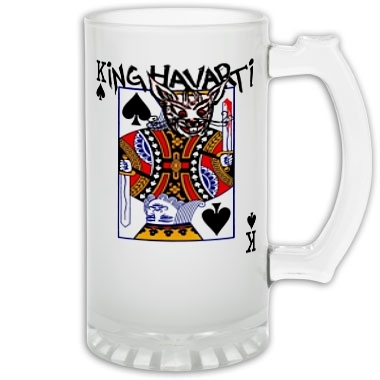 I mean, really, who doesn’t want a Havarti Beer Stein. Crazy people, that’s who. I hope everyone is excited for (even) MORE DANCE this weekend! I know I am. And I’m sure you’ve already all made your reservations, because if you remember from last year, our one performance was packed full. 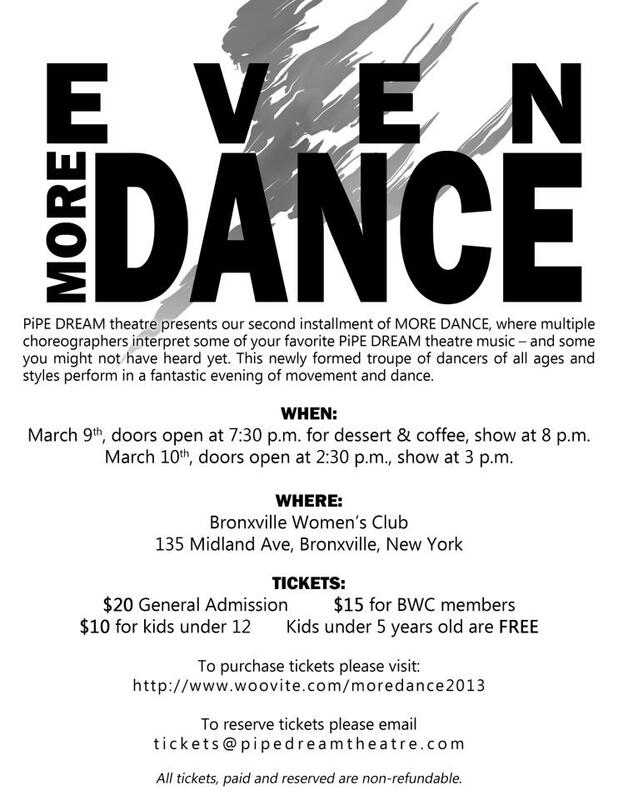 So you wouldn’t want to make the mistake of not reserving with us at tickets@pipedreamtheatre.com or buying your tickets here: http://www.woovite.com/moredance2013. Might I even suggest making a weekend out of it? For instance you can start by watching the entirety of last year’s performance on our YouTube channel. Then you can sit on the couch and cry because you know you just aren’t that graceful and play video games until the world doesn’t seem real anymore. Then you can come out and be AMAZED by the new performances premiering at Bronxville. AND if you do all this on Saturday you may even want to wash, rinse, repeat it for Sunday. ALSO! Are you signed up for our newsletter? You should be, because it is informative, and regularly scheduled, and pretty, and it doesn’t sound like the person who wrote it is sleep deprived (AKA the opposite of this). It’s SUPER EASY! All you have to do is email info@pipedreamtheatre.com and put “newsletter” in the subject line. That way we’ll know that you want to join our mailing list. Here’s an HTML version of February’s NL to entice you even further. We’ve got live singing, a fun atmosphere, previews of upcoming projects, and um yeah hi SPAGHETTI! Dinner is served at 7pm and dessert will follow the performance as well as mingling with the cast. 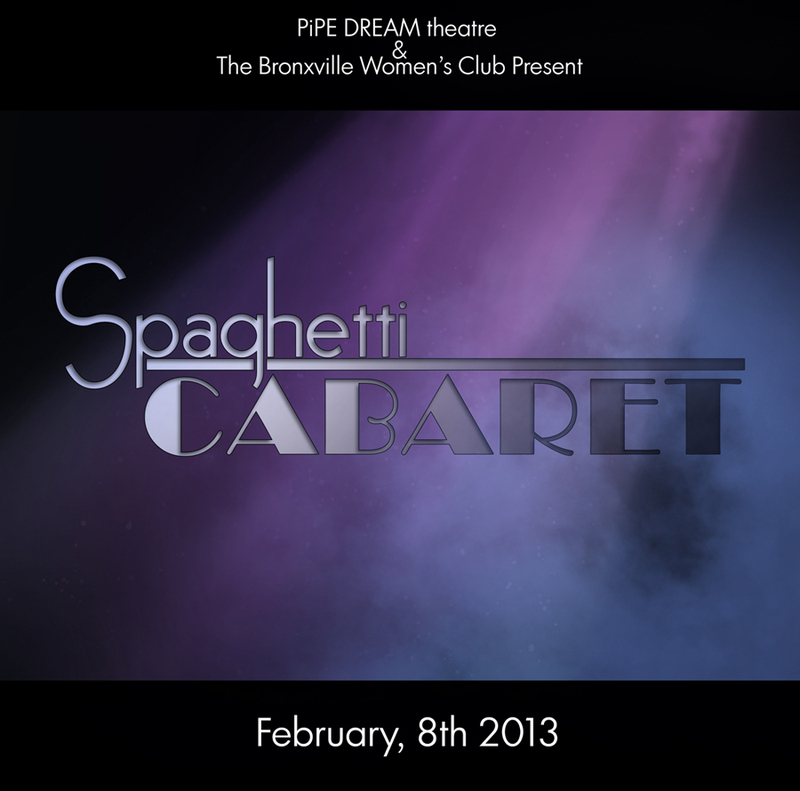 If you plan on coming email us at tickets@pipedreamtheatre.com. That way we still have spaghetti for you.